Hillgrove took three games from North Paulding in Region 3 play to capture the region title. The Hawks won 4-0 on April 9 as pitchers Deion Walker and Alex McKay combined to hurl a four-hit shutout. Walker worked six innings to earn the victory. Hillgrove then took an 8-4 victory on April 11 behind six solid innings from pitcher Jared Rine and Ethan Wright’s 2-for-4, two-RBIs performance. Mickey Maguire and Cole Dunn had two hits each for North Paulding in the loss. Then Hillgrove finished the three-game set with a 15-5 victory on April 13. The Hawks finished with 15 runs on 12 hits. Walker finished 2-for-3 with a homer and four RBIs. Mill Creek took over first-place in the Region 6 standings, taking three games from North Gwinnett. In a 2-1 victory on April 9, Davis Sharpe’s two-run homer in the third inning was the difference. Sharpe finished 2-for-3 to help pitcher Brandon Blume earn the victory on the mound and outduel North Gwinnett ace Walker Cleveland. Blume went 6 2/3 innings, allowing just a run on six hits. Alaska Abney worked the final inning for the save. In a 1-0 victory on April 11, Sharpe struck out nine and hurled a one-hit shutout. Drew Cadena had two hits to pace Mill Creek’s six-hit attack. Then the Hawks completed the sweep with a 9-6 victory on April 13. Alex Boychuk went 2-for-3 with a double, a homer and two RBIs, while Parker Landua, Brendan York and Mitchell Schreiner finished with two hits each. Josh Shuler, Jayden Perrine and Lavoisier Fisher finished with two hits each for North Gwinnett. Mountain View took two of three from Peachtree Ridge in Region 6 play. Matt Lee’s RBI single in the top of the seventh broke a 7-all tie and helped Mountain View to an 8-7 victory on April 9. Chase Chaney went 4-for-4 with two doubles and an RBI. Peachtree Ridge took a 3-1 win on April 11 behind Ashton Shepherd who went 3-for-4 with a double and two RBIs at the plate. Chaney allowed just two unearned runs on two hits to earn the complete-game victory in a 6-2 win for Mountain View on April 13. Andrew Phanmanee, Garrett Spikes, Jackson Peck and Lee each finished with two hits to lead the Bears. Parkview holds a one-game lead in the Region 8 standings with two key games against arch-rival Brookwood this week. The Panthers went 3-0 last week with two wins over Norcross and a forfeit victory over Meadowcreek to improve to 23-4. Pitchers Robert Bennett and Braden Hays had solid wins on the mound. Bennett went 5 1/3 innings in a win over Norcross. He allowed just two earned runs on four hits and struck out 10. Hays earned a complete-game victory, allowing just one earned run on three hits and notching eight strikeouts. In the two games, Bennett went 4-for-7 at the plate with three doubles, a homer and four RBIs. Allan Del Castillo also went 4-for-7 with a pair of RBIs. Woodstock took three games from Cherokee to improve to 23-4 and leads the Region 4 standings by a game with three region games left. Caleb Bartolero batted .444 in the three-game set with two doubles and three RBIs, Cooper Torres batted .400 with a homer and three RBIs, while Spencer Keefe batted .400 with a double, a homer and three RBIs. The Wolverines also got strong pitching from Zach McManus who went 6 2/3 innings, allowing one earned run on two hits and striking out nine to notch a victory. Josiah Siegel hurled a complete game shutout, striking out seven and allowing just four hits. River Ridge and Allatoona split a pair of key games in Region 6 play. With two games left, Allatoona holds a one-game lead in the region standings. River Ridge won 11-1 on April 10 when Connor Pavolony went 4-for-4 with a double, two homers and five RBIs. Nick Blubaugh earned the win on the mound allowing just an unearned run on three hits to earn the complete-game victory. Blake Evans finished 2-for-3 for Allatoona in the loss. But the Buccaneers rallied to win 7-5 on April 12 as Greg Boland went 3-for-4 and Payton Eeles and Evans had two hits apiece. Eeles had two RBIs. Loganville won a big Region 8 game on April 13 with a 4-2 win over Buford. Pitcher Bay Witcher threw a complete game for the victory. Tanner Greene hit a solo homer in the bottom of the sixth inning to give the Devils a two-run lead. The two teams play again on April 16. McIntosh took two of three from Griffin in a critical three-game set in Region 3 play. The Chiefs got big performances from senior Ethan Ange who went 5-fot-7 with a homer and six RBIs in the three games. Ange also earned a pitching victory to improve his season record to 6-1. Junior Andrew Pinckney went 4-for-6 with a double, a triple and five RBIs in the three games. Villa Rica went 3-0 in Region 7 play with two victories over Carrollton and a win over East Paulding. The Wildcats defeated Carrollton 5-4 on April 9 behind pitcher Logan Smallwood’s complete-game victory. He allowed seven hits and struck out five. Catcher Noah Best went 3-for-4 to lead the offense. The Wildcats then took a 1-0 eight-inning victory on April 11. Tristen Allen’s suicide squeeze scored Bryson Smith for the game’s only run. Jacob Turner earned the victory with a complete-game shutout. Smallwood then pitched the Wildcats past East Paulding 4-2 on April 13. He allowed just one unearned run on four hits in the complete-game victory. After LaGrange took a one-run lead over Cartersville in a key Region 5 contest on April 13, the Hurricanes exploded for 14 runs in the top of the sixth to win 18-5. Josh Davis broke the game open with a grand slam, while Jake Gooch added a three-run homer in the inning. Cartersville can claim the Region 5 title outright on April 17 with a victory over Troup. The game will be played in Cartersville. North Oconee took three games from Stephens County in a key three-game set in Region 8 play. 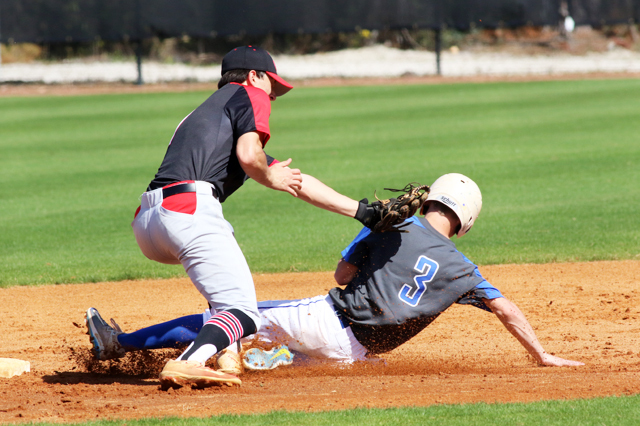 The Titans won 3-0 on April 9, 7-4 on April 11 and 12-8 on April 13 as North Oconee maintained its grip on second-place in the region standings. Pitchers Kumar Rocker and Dom Hughes combined on a two-hit shutout on April 9. Rocker struck out 12 in his six innings on the mound to earn the victory. Rylan Laird went 2-for-3 on offense with an RBI to lead the North Oconee offense. In a 7-4 victory on April 11, Laird, Will Pearson and Woody Barks collected two hits each to lead the offense. Zach Boyd had two doubles in a losing cause for Stephens County. Then in a 12-8 win on April 13, North Oconee finished with 13 hits as Will Cain, Laird, Kyle Sherrer and Bennett Toci collected two hits each. Griff Pruitt went 2-for-3 with two doubles and three RBIs to lead Stephens County. Northside-Columbus’ Hunter Poe reached on an error allowing Mack Williams to score the game-winning run, breaking a 6-all tie in the bottom of the eighth inning to help the Patriots to a 7-6 victory over Columbus High on April 12. Spalding took two of three from West Laurens in Region 2 play last week. West Laurens won the first game of the three-game set 7-6 on April 9 when Brandon Bruton’s RBI single in the bottom of the 14th scored EJ Homes for the walk-off win. But Spalding took a 3-1 victory on April 11 behind pitcher Dreylin Holmes, who allowed just one run on five hits to earn the complete-game victory. Ryan Smith went 3-for-3 with a triple to lead the Spalding offense. Then in a 6-3 victory on April 13, Parker Schultz went 2-for-2 with two doubles and three RBIs to help pitcher Chase Coppock earn the complete-game win. West Laurens, however, still maintains a two-game lead in the Region 2 standings. Westover had a handful of standouts despite a pair of losses to Cairo and Deerfield-Windsor. Catcher Kedarrius Cunningham batted .429 in the two games, including a 3-for-4 performance against Deerfield-Windsor. Cameron Hopkins batted .400 in the two games with three RBIs, while Davis Spalinger batted .400 with a double and an RBI. Calhoun managed to stay in second-place in the rugged Region 6 standings after Parker McPherson’s two-out single in the bottom of the 11th gave the Jackets a 2-1 win over Bremen. Fannin County won its last eight Region 7 games by winning two of three from East Hall, three from Lumpkin County and three from Union County. Four different Fannin County pitchers pitched during the eight-game winning streak, Senior Grant Baker won three, sophomore Mathew Shirah won two, junior Carson Beavers won two and senior Garrett Rogers won one. Fannin County has completed its region schedule and has earned a postseason spot. Its seeding, however, is unknown. Greater Atlanta Christian is still two games behind North Hall in the Region 7 standings, but GAC cooled off the red-hot Trojans by taking two of three last week. Greater Atlanta Christian won 14-2 in five innings on April 9 behind pitcher Tyler Bride who allowed one earned run on three hits. Jack Coyle went 4-for-5 on offense with a pair of RBIs, while Pirmin Brechbuhl went 3-for-4 with three RBIs. North Hall took a 7-2 win in the first game of the doubleheader on April 13 behind pitchers Caleb Clark and Charlie Erickson, who combined to allow just two runs on six hits. Reese Olson went 2-for-5 with three RBIs to lead North Hall’s offense, while Clark, Caleb Wiley and Tyler Brooks each finished with two hits. But GAC took the nightcap 9-5 as pitcher Jake Johnson earned the victory going 6 1/3 innings. Carson Taylor went 2-for-3 to lead the Spartans’ offense. The loss spoiled a 3-for-4 performance from North Hall’s Caden Bales. Ringgold captured its fourth straight region title on April 13 with a 13-3 victory over Haralson County. It was another big week for the Tigers who defeated Calhoun 12-0 on April 9, North Murray 15-0 on April 10 and Coahulla Creek 6-3 on April 12. During the four-game stretch, senior Gavin Hollis went 5-for-13 with three RBIs and Nathan Camp went 8-for-13 with a homer and four RBIs. Camp was also the winning pitcher against Haralson County, striking out 10 in six innings. Junior Johnny Camilucci went 2-for-2 with a homer and three RBIs while also allowing no earned runs in four innings in the victory over North Murray. Senior Ty Jones went 5-for-12 with four RBIs during the four games, while Andre Tarver (5-for-12, four RBIs), Dalton Schley (9-for-13, homer, seven RBIs), Wyatt Tennant (4-for-10, four RBIs) and Holden Tucker (5-for-14, four RBIs) also had big weeks at the plate. Casey Pate went 2-for-2 with an RBI in the victory over North Murray. Tennant threw six strong innings against Coahulla Creek, striking out nine and allowing just an earned run, while Tucker threw five shutout innings and struck out five in a win over Calhoun. Benedictine wrapped up the Region 2-2A title with a pair of one-run wins over Jeff Davis. The Cadets won 2-1 on April 10, then took a 6-5 nine-inning win on April 12. Johnny Richardson and Jacob Markiton had two hits each to help Carter Holton earn the victory on the mound on April 10. Then Markiton scored on a wild pitch in the bottom of the ninth to help Benedictine break a 5-all tie and clinch the region crown on April 12. Garrison Gunby’s two-run homer and Holton’s solo homer highlighted the offense for the Cadets. Markiton and Holton finished with two hits each. Jeff Davis has lost three straight, including a pair of one-run losses to Benedictine last week. The Yellow Jackets lost 2-1 on April 10, then lost 6-5 in nine innings on April 12. The extra-inning loss spoiled excellent offensive performances from Chandler Davenport, Seth Graham and Garrett Baucom, who finished with two hits each. Rockmart went 2-1 on the week, but its 11-inning 3-2 loss to Chattooga on April 10 was a big blow for the Yellow Jackets. Clayton Johnson drew a bases-loaded walk to force home the game-winning run to help Chattooga win. Both teams managed a combined 10 hits and lost in the finale was an excellent pitcher’s duel between Chattooga’s Dexter Brown and Rockmart’s Ty Floyd. Both starters got no-decisions. Rockmart did end the week strong with victories over Gordon Lee and Pepperell. Pitcher Griffin Pace allowed just two runs on two hits, while Jonathan Suppes and Floyd had two hits each in a 5-2 win over Gordon Lee. Screven County pitcher Ross Crews may have helped his Gamecocks secure the No. 2 seed in Region 4 with a 5-1 victory over Harlem on April 10. Crews allowed just one run on seven hits in 6 2/3 innings to outduel Harlem pitcher Ryan Smith. Jordan Hodges went 1-for-2 with a pair of RBIs to lead Screven at the plate. Jordan McCladdie and Jackson Lonergan each went 2-for-3 in a losing effort for Harlem. Social Circle split a doubleheader with Rabun County on April 13 and it cost the Redskins the Region 8 title. Rabun County won the first game 3-2 behind pitcher Chase Horton who allowed just two runs on three hits. Grayson Lane added an RBI double. Social Circle pitcher Chandler Ball struck out 14 Rabun County batters in a hard-luck loss. He also had a triple which scored two runs. But Social Circle took a 6-1 victory in the nightcap. Ball, Mason Harris, David House and Jackson Will finished with two hits each to lead the Redskins. The loss spoiled a 3-for-3 performance from Rabun’s Colin Crosby. Charlton County defeated Irwin County 8-2 on April 10 in Region 2 play. The Indians hold the tie-breaker in the region standings by sweeping Irwin in the two games this season. Pitcher Jack Gowen earned the complete-game victory, allowing just two runs on five hits and striking out seven. He also went 3-for-3 at the plate with a two-run homer. Trevor Knowles and Israel Gilyard also collected two hits in the victory. Charlton also took an 8-2 victory over Wilcox County on April 13 to improve its season record to 19-6. Peyton Mercer hit three homers and finished 3-for-4 with four RBIs in a 9-5 loss to Savannah Christian on April 11. Gordon Lee is 20-5 on the season after taking a pair of games from Mount Zion-Carrollton. The Trojans lost a 5-2 decision to Rockmart on April 12. Gordon Lee’s Mason Pettigrew and Justin Wooden had the team’s only two hits in the game. Irwin County rebounded from a loss to Charlton County on April 10 with two big wins over Hawkinsville and Lanier County. Irwin defeated Hawkinsville 6-2 on April 12, then cut down Lanier County 11-1 on April 13 behind Hunter Spires’ three-run homer. Brodie Chestnutt, who was also the winning pitcher, and Will Hudson finished with two hits each. Irwin County is 19-4 on the season. Schley County went 4-0 last week and has won 10 straight. The Wildcats defeated Taylor County 11-0 in five innings on April 9 behind freshman pitcher Dylan Taylor who allowed just two hits and struck out seven. The Wildcats took two from Mount de Sales, then pounded St. Anne-Pacelli on April 13. Jordan Hall went 8-for-14 at the plate in the four-game stretch with a homer, a triple, three doubles and 12 RBIs. The Wildcats are 18-2 on the season. Taylor County pitchers Matthew Deloach and Gunnar Watson combined to allow just one run on four hits in a 2-1 thriller over Brookstone on April 13 in Region 4 play. Deloach struck out 11 in six innings to earn the victory, while Watson needed just eight pitches to earn the save with a scoreless seventh inning. Watson’s RBI double scored all of Taylor County’s runs. Carter Albritton and Conner Tharpe had two hits each for Taylor. Taylor County snapped Brookstone’s 15-game winning streak with a 2-1 victory over the Cougars on April 13 in Region 4 play. Richard Hill drove in Brookstone’s only run in the game. Calvary Day’s Chance Litchfield hurled a four-hit shutout to beat Savannah Country Day 2-0 on April 11. Kaden Blankenship went 2-for-4 at the plate with an RBI to lead the offense. But the Cavaliers lost the next two to Savannah Country Day and are 17-7 on the season. First Presbyterian Day split a pair of games with Stratford in Region 7 play. The Vikings won 6-2 on April 10. Gavin Bloodworth and Garrett West drove in two runs each, while Hudson Mimbs collected two hits to help Noah Takac earn the victory on the mound. Trey Giles led Stratford with a pair of hits. But Stratford took a 4-3 victory on April 12. Carson Dorsey’s RBI single scored the go-ahead run in the top of the seventh to help the Eagles win. Sam Clark went 2-for-4 at the plate for Stratford, while pitchers Sammy Martin and Trey Giles combined to allow First Presbyterian just two hits. Holy Innocents’ pitchers Ryan McCrorie and Ben Keever combined to shut down Mount Paran Christian’s offense in a 9-6 victory on April 9. McCrorie, Caleb Ketchup and Sam Aiken finished with two hits each. The Golden Bears then defeated Pinecrest Academy 12-10, Weber 7-2 and Eagles Landing Christian 12-7 to improve to 16-8 on the season. Kings Ridge Christian split a pair of games against Mount Paran Christian in Region 6 play. The Tigers won 9-7 on April 11 as Will Pittman went 2-for-2 with four RBIs. Mount Paran Christian went 1-2 on the week, falling to Holy Innocents 9-6 on April 9 and splitting a pair of games against Kings Ridge Christian. Wood Kimbrough went 2-for-3 with three RBIs in the loss to Holy Innocents. Kimbrough went 2-for-3 with three RBIs in a 9-7 loss to Kings Ridge Christian on April 11. Cameron Cantwell also had two hits and two RBIs in the loss. But Mount Paran took a five-inning 16-5 victory on April 12 behind Austin Ross’ grand slam and six RBIs. Jack Alexander went 3-for-4 with a homer and three RBIs. The Eagles are 18-3 on the season. Savannah Christian has won 13 straight since its last loss of the season, a 13-3 setback to top-ranked Tattnall Square on March 3. The Raiders won two over ECI in this week’s Region 3-1A tournament to capture the region title again. Pitcher Kyle Hilton struck out eight in six innings of work in a 9-5 victory on April 11 to earn the win on the mound. Joey White went 3-for-3 with two doubles and two RBIs, while Cameron Crosby and Justin Anderson had two hits each. Then Jarrett Brown went 3-for-4 with a homer, a triple and four RBIs and was the winning pitcher to help Savannah Christian in a 12-3 win on April 11. The Raiders are 21-2 this season. Savannah Country Day is one of the most-improved teams in the Class 1A Private classification. The Hornets are 16-8 after taking two of three from Calvary Day in Region 3 play. After falling 2-0 on April 11, the Hornets took a 10-0 victory in five innings on April 12 behind pitcher Jarrett Karnibad who allowed just one hit. Christopher Pendleton went 2-for-3 with a double and three RBIs, while Braden Sorge and Ashley Pinckney had two hits each. Then Pendleton’s grand slam keyed the Hornets to an 8-4 victory on April 13. Top-ranked Tattnall Square split a pair of games with Strong Rock Christian on April 10. The Trojans took the first game of the doubleheader 13-1 in five innings behind pitcher Luke Laskey. Logan Fink went 3-for-3 on offense with a grand slam, while Dawson Brown and BJ Spears went 2-for-3 with two RBIs each. But Strong Rock scored three runs in the top of the seventh, then held on for a 9-7 victory in the nightcap. Tiger Boron went 2-for-3 with a double, a homer and four RBIs to lead Strong Rock’s six-hit attack. Tattnall is also the No. 1 team in this week’s GHSA Class A Private power rankings.